Wesham Santas in the dark on the fells! The main race of the week was the Myerscough 10 Mile, replacing the previous Guy’s 10, taking in the quiet Fylde roads out round Inskip. David Taylor was the fastest Wesham runner in the field, finishing 12th in 61:56. Carmel Sullivan was next in, back on form after her holiday and 10k in Benidorm last week, finishing 4th woman and 1st W50, 53rd overall in this case with a fine run of 1:11:22. Jason Blagden was 66th in 1:14:21 finishing 10th M45. Rob Wallace was next in in 71st place with his time of 1:15:08 and Ben Wrigley ran 1:23:59 for 123rd place. Finlay McCalman was 151st and 12th M50 in 1:27:05 and Paul Carter 168th with 1:30:08. Tanya Shaw finished 45th woman and 11th W40 in 1:31:19, 179th overall. Peter Bartlett was 2nd in his new age group M70 with 1:30:20 for 173rd place overall. John Howorth finished 7th M65 and 228th in 1:40:46. Debbie Myerscough ran her longest distance since returning to running this year with a fine 1:41:01 to place 8th woman and 9th W50, 232nd overall. Collectively the Wesham men finished 8th team with hosts Garstang RC first, and the women were 6th with the winners Garstang again. Simon Denye ran the Podium 5k ‘B’ race in Barrowford on Saturday and he finished 2nd in 17:14, placing him 69th in the combined results with the ‘A’ race, and 3rd M45. 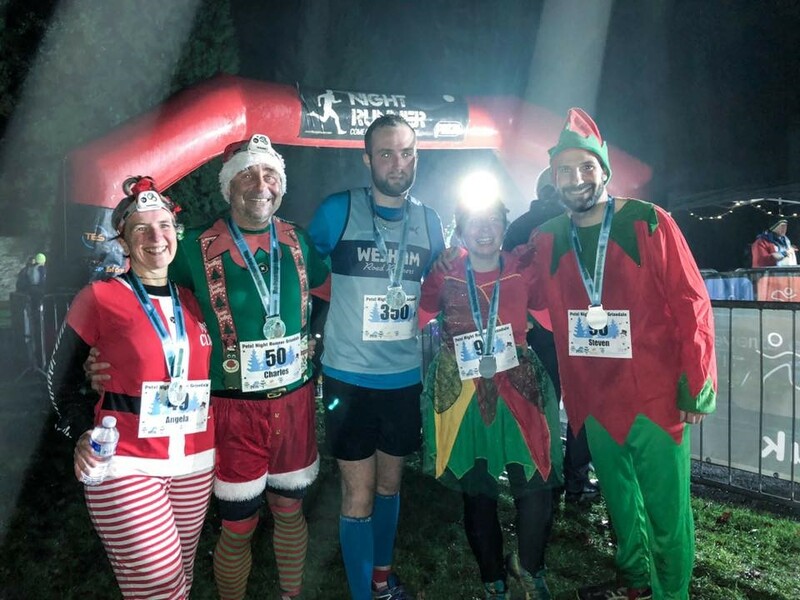 In the Grizedale Night Runner 10k Festive Run in the Lake District on Saturday evening there was a half gross of Wesham runners out in the dark with their headtorches. Steve Abbott stormed round in 43:04 to finish a fine 7th and 2nd M40 on the hilly forest tracks, scoring an age-graded time of 40:23. Steven Gore finished 22nd in 46:03 with an age-graded performance equating to 44:29. Elliot Costello was 66th in 52:57.Angela Colby finished 40th woman and 18th W40 in 61:43,with her age-graded equivalent of 55:19 and 160th overall. Chas Colby had the same finish time; 55:17 M40 graded performance, and Vicky Gore came in 73rd woman and 218th overall; 25th W40 in 1:06:55, 1:03:04 for an age graded performance. Paul Lancashire ran the Lancaster 3-1-5 Half Marathon on Sunday and he finished 31st with a time of 1:37:47 as 2nd M35. Wesham had a big turnout at the Lytham Hall parkrun on Saturday morning as it was the 3rd anniversary and the club were providing the individual pacerunners. David Taylor ran the second fastest time of the morning and the fastest male time, clocking 19:44 with an age grade performance percentage of 65.88%. Jonathan Lawson ran 21:52 for an M50 grade of 67.99%. Steven Gore tested his legs before the Grizedale night Run with 22:12 for M35 60.14%.Stuart Topping is getting back to fitness with 23:44 for M45 60.67% and Peter Rooney M60 63.00% with a time of 25:27. Carl Groome was pacing at 26 minutes with 26:09 and M45 grade of 55.96%. Sharon Cooper ran 26:16 for W45 60.47% and Finlay McCalman 27:14 for M50 55.94%. Vicky Gore had a W40 grade of 56.85% with her time of 27:16 and Kay Twist ran with hubbie Stephen for 27:26 (W45 60.39%and M50 54.62%). James Birchall clocked 28:19 for an M25 45.62% and Clare Belfield 28:23 for W35 53.02%. Julie Rooney ran 30:03 for W40 52.36% and Antoinette Holton paced 30 minutes with 30:04 for W30 49.56%. Sally Deacon was on 30:24 with W50 56.52% and Caz Wadsworth returning to running after nearly a year off with injury ran 32:48 for W50 53.10%. Sue Rigby recorded 33:51 for W4546.92% and Ben Wrigley with his daughter ran 34:12 with M35 39.33%. Dave Jones ran 37:08 for M70 47.49% in his new age category. Susan Gillott had her firs trun out with 42:16 for W55 44.01 with Kerry Eccles in support at 42:37 for W5542.47%. Tracey Hulme was out at the South Manchester Parkrun on Platt Fields and she ran a flat 24:00 for W55 75.42%. In Preston’s Avenham Park Nigel Shepherd ran 21:03 for M60 76.17% and Steve Myerscough continues to get fitter with an M45 67.01% with a run of 21:10. Robert Brown ran 28:05 with M60 57.63%.Chris Pike was out in St Helens Victoria Park with 27:44 for M40 50:36%. Elizabeth Johnson was in Edinburgh and she ran 25:15 for an event personal best performance with W35 60.20%. James Mulvany was running with his JM10 son in 25:49 (52.87% and the Junior 65.91%). George Kennedy was in the Blackpool run in Stanley Park with 24:40 for an M60 grade of 65.61% with Suzanne Leonard 24:52 with W45 65.82%. Andrew Moore ran 27:01 with M55 57.87%. Martin Bates took to Fleetwood Promenade and ran 23:48 for M60 68.56 and Brian Jones clocked 31:24 with M55 49.79%.